I went to a local craft show and bought 6 bars of Linda's soap(woolispinner), a wooden bowl that her son Michael made, several handmade greeting cards for my stash, a pair of fingerless gloves to keep my hands warm at my computer in the winter, and a gorgeous bunch of bittersweet. I feel OK though, because it was all handmade and local. Marlene, I love those library sales; we had one at our farmers market that was donation only, and I was buying books nearly every week! I've lost quite a bit of weight and could have cried when I dug out my cooler weather clothing....nothing fit. I thought oh well I'll just have to take them to consignment shop and get some new sweaters and cold weather clothing. Went to the Goodwill and found a nice fleece blazer, I did score a couple pair corduroy pants and very nice warm wool coat and leather jacket at a yardsale for a real bargain...$2 for cords, $3 for wool coat with hood....$3 for brand new brown leather jacket. Dreaded giving up my favorite sweaters from last year, thought well, what have I got to lose? So I put them on the sewing machine & simply ran a stitch from sleeve around armpit & down the sides, then just cut off the excess. It worked! My cotton sweaters (8 of them) fit great so now I can get a couple more seasons use out of them and don't have to go buy new. I even stitched up a couple dresses because I thought I'd only get a few dollars for them anyway at consignment so took a chance and took them in on side seams and it worked, you can't even tell they were altered and by wearing a long sleeve top underneath and pairing with a sweater/blazer and leggings I can still wear lighter weight dresses through the cold weather. Hubby picked our basil before frost hit so I made and froze pesto in ice cube trays and my kraut is made and can't hardly wait until it's done. I had a huge stroke of luck this week too. I unplugged our chest freezer to plug in my iron to press some clothes only to forget to plug it back in. Three days later I discovered it and dreaded opening it but everything still frozen....COULD NOT BELIEVE IT! Very lucky. I dehydrated quite a bit of basil today. Also dehydrated onions to make onion powder tomorrow. Ground up my previously dehydrated garlic into garlic powder today. I wanted some infiniti scarves,but did not want to pay the price. I watched you tube vidoes to get an idea how to make them. I then went to our local thrift store and purchased some long poly cotton rayon summer sleeveless dresses and some skirts too. Took them home, washed them and then tore them apart. I used my rotary cutter and made the longest 7 and 9 inch strips depending on the heaviness of the fabric. I then sewed the strips together to desired length. I hemmed the cut edges. I bought dresses that had the same design and brightness on both sides. I also made a couple using skirts. Cutting them the width in a tube, hemming and wearing them that way. I am very happy with my creations. I am going to make some for my girlfriends for Christmas. Great thing, here every Wednesday is quarter day. Almost everything in the store is a quarter. True story, can anyone beat that? I volunteer there too, it is so cheap because we can not keep up with donations. Anita! How smart! You've inspired me with your sweater project! AWESOME, farmgirl!!! Thank you!!! Kelly - I haven't made garlic or onion powder yet, but can't wait to do it! Just wondering: How much do you get from one onion, or one bulb of garlic... I'm trying to plan how much to dehydrate to fill a small jar... Thank you! Kem! I love my infiniti scarves! You can wear them so many different ways - SO versatile! Mine are knit ones made of wool, purchased from a great seller on ebay, but I've asked one of my girlfriends to teach me how to make them so I can give some for Christmas. I love your project, too, though. Maybe I'll do that, too! Thank you! My goodness - you all always have so many wonderful ideas! Thank you for sharing!!! Saved money this weekend by making super good chicken stock from a leftover roasted chicken. I could've made soup, but decided to freeze the stock for now. Next time I roast chicken, I'll make more stock, combine the two and make a big batch of soup for canning. We can't get enough of the stuff - it's just so delish and so much better than the stuff at the grocery store! So hearty and warming for the body and soul on a frigid fall or winter's night! For my onions I grow so many multiplying onions. The bulbs are so much smaller, I usually just dehydrate them. Takes quite a few but I have hundreds of them so I just keep going. As for garlic I eat and replant the largest cloves, then dehydrate the smaller ones. So again it takes quite a few to amount to anything. But the flavors in both are so much better and robust. I think you will love them both. Oh Mz Nini, I just read your post about the farm raised turkeys you purchased. Last year I decided to purchase chickens and quail and turkeys are on the list for my ranch for this year.....to raise and sell. I am soooo glad you had a good experience and it is encouraging for an up and coming turkey rancher. Can I use your words on my blog? How much did your bird weigh and how much did you pay.....if you don't mind my asking. Did I save any money today. Yes. I worked on my chicken coop for my free range birds. I decided that a ranch this size has a lot of stuff/items that could be utilized for the roof and sides. I dug thru junk and found the poles of an old carport that had a canvas cover with is long gone and used the poles for the rafters of the coop. I have a tarp to use over the outside yard area. Its only for night time becoz they will be out during the day. I found some fairly thick panel sections to nail on to the sloped roof section. I did laundry, 2 loads, with homemade soap and hung the clothes on the line. I did not start the car or the tractor or the lawn mower.....I could have coz there is always a chore or 8 that need doing. Equipment was quiet. Nice for a change. Eating meals from the freezer to make space for the deer I WILL get this year. We have been heating with wood and delaying turning on the furnace. We have a creek on our land so have our own wood also. I made biscuits for lunch to go with left over stew. Served it with homemade jam. Worked on infiniti scarves. I tore apart thrift store dresses to make the scarves out of. I am very pleased with the fabric I have work with. Used homemade cleaner to clean underneath the bathroom sink. I keep telling every little thing I do counts. For today I have made windshield wiper fluid for all our vehicles. Dehydrated many more onions and herbs. A neighbor gifted us with quite a few tomatoes. Going to quarter day at our local thrift shop this morning and then off to two facebook classes on marketing and social networking for a total of 8 dollars. It should very informative. Looking forward to the day. The infinity scarves sound like a neat project! I will have to look out for some dresses for that. My husband has to buy a pad and a cell phone for work. We were told to go to the Sprint store for the best deal and just listen to what we got. A free basic phone when we signed up for service at $50/month unlimited minutes. A pad for $50 plus service, not sure how much that is, maybe $100/month. His IKON cost $250/month to use for work. It has the capability of pads and cell phone but is very slow and unreliable. So he is now saving $100/month and I get to play with a pad. Yesterday was not a save money day. Went to another craft show and bought a ruffly scarf to match what I was wearing and 3 bars of homemade soap, my weakness. I put a turkey in the oven, deboned, and in the freezer. Eating turkey these days, about half price of chicken here. I also stamped and colored Christmas cards with my pencils received from Mary Jane friends. The barter group is really fun here, and these gals really come through. Today is church, work on gutters, and take a walk. Should be an enjoyable day. 3 bags of pine cones, free. Found along the lane I live on. I'm going to use some for an outdoor decoration. Some will get slathered with peanut butter and rolled in seed for the birds. what you are looking for and I would love to help you. 'Sorry I didn't see your post sooner, Daizy... I know we had ordered one of their larger turkeys - 20 - 25 lbs. (I am pretty sure it was a 24 pounder), and it came to a little over - gulp - I hesitate to even say it - sixty dollars. Yeah... I almost fainted, too; especially after having to face my husband who had just heard the butcher say the price out loud. LOL! But honest, it was worth every single penny! We buy our meat in bulk whenever we can, so when we saw just what we got out of it, we felt it was well worth it. I'd be happy to email you something for your blog, if you like Daizy. Just let me know! Also - I'm sure most of you know this, but if you don't... When you go to shop online, ALWAYS make sure you do an internet search for store coupons to the website where you're making your purchases! I know you can get them readily from retainmenot.com, but there are also plenty of other sites out there that feature current store specials, discounts, free shipping and coupon offers. I always look online when I'm shopping Yankee Candles, because sometimes there are other coupon codes available out there that I haven't received in my email offers directly from the company. I've lucked out with other websites, too. I know it's a hit-or-miss kind of thing, but when you can save, it's well worth the few extra minutes to search! I hit a MAJOR score at the grocery store today!!! Hubby has a lunch function to go to where local police will be the main guests, so we wanted to get something really good and hearty as our contribution to the potluck table. I attended the same function a few years ago and took filet mignon "sliders" and boy howdy were they popular, so hubby wanted to repeat it. Grocery store #1 had huge filets at $20.99 a pound. Ouch. Hard to look at a $130 price tag on one hunk of cow. Not only did grocery store #2 have it on sale for $14.99 a pound, but gave me $3 per pound additional discount because I took the whole thing still in the packaging from the packing plant - no muss no fuss for them and $11.99 a pound for me. Wooohooo! Eight pounds of filet mignon is a beautiful thing for us carnivores. So now hold on to your taste buds if you like sweet and savory together. We roast it to medium rare in the thickest part and medium in the thinner parts, and it is seasoned pretty strongly with salt, pepper and garlic and lightly with thyme. It then gets sliced and served on those little King Hawaiian rolls that are lightly sweet (yum) with horseradish sour cream. I am slobbering on my keyboard. And I saved a pile-o-cash. Nini, I was expecting you to say $80.00 :) I can't wait until next year to try one of those turkeys. Cindy, I am NOT letting my husband read this! He would absolutely love those sliders! I go thru www.mrrebates.com when I shop online. Most sites won't allow extra coupons or it nulls mrrebates. Stores vary with % of rebate. But every little bit helps. I check to see if the store is on mrrebates, if not I do try retailmenot or just google for coupons. ~I found a website The Prudent Homemaker which has many great ideas for saving money. I plan on using some of the menu ideas soon. I want to do a complete inventory of freezer and pantry items and see what kind of menus I can come up with. ~I have been going through my seeds to figure out what I need for next year's garden and already have quite a few left (yay!). For those that I need I will be ordering now (while on sale) or perhaps bartering for. ~Dug up some Horseradish roots and will be grating those tomorrow to store in the freezer for my honey. Yesterday, I made up a batch of homemade laundry detergent from the recipe posted here on the MJF connection last summer. I love how economical it is and what a great job it does with cleaning my clothes. PLus the clothes smell so fresh and clean. I am also new to the routine of using a half cup of white vinegar in the rinse cycle but I must say, it does seem to keep things brighter. I especially like how the towels stay fresher and brighter as well. It is such a cost effective way to do your laundry and it really works. ~We called USAA Insurance and were able to get even better coverage for our auto for almost $40.00 less per month! I had forgotten about them and since my honey is honorably discharged from the Air Force he qualifies. Today will be an easy day not to spend. We have an ice storm moving in. I am in the process of doing deep cleaning in our house. I am rearranging and purging. I hate doing it, but feels good. I stripped the wallpaper border in our daughter's room yesterday. I have cleaned out a big walk in closet and have items set out for our thrift store. I am going to fry up 6 lbs of hamb. today to put in the freezer for when family is home next weekend. Always nice to have that part done. Tradition to have hay stacks (like tacos, except meat and toppings go on top of corn chips. Also going to make chili when they are home. Can't believe I did this, but started listening to KLOVE Christmas online. Soooo, I am cranking up the music and will continue to clean. Not leaving the house today. Also have to work on a grant for our town. Going to do that via phone with my partner. Better yet, I sold a vintage cupboard, need to get it cleaned out. It goes to a new home tomorrow. Will be making money, whoo hooo!!!! 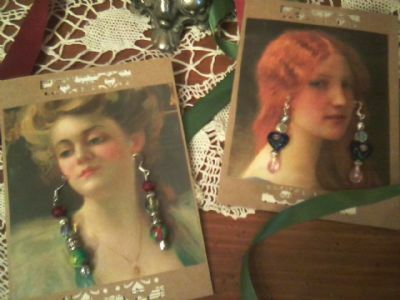 Here is a photo of the earrings I made. I had some old Victoria Trading Company catalogs and used the pages to attach to blank cards that I had and messed around with a punch.